Art throughout Volume 16 of Clare by Katie Chandler. There’s been a lot of great news lately. I’m delighted to share that my short story “Beast and the Beauty” is in the Spring 2015 issue (Volume 16) of Clare Literary Magazine, a publication of Cardinal Stritch University. You can read “Beast and the Beauty” and the full issue for free by CLICKING HERE. Thank you to the Editorial Team at Clare Literary Magazine. 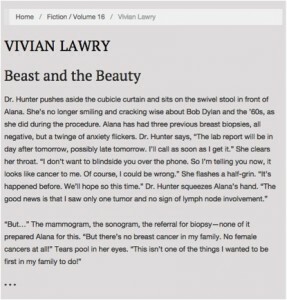 Click the text to read the rest of “Beast and the Beauty” in Clare Literary Magazine.